The recipient potato cultivar influences the genetic makeup of the somatic hybrids between five potato cultivars and one cloned accession of sexually incompatible species Solanum bulbocastanum Dun. Somatic hybridization is a biotechnological tool, which allows the transfer of multiple resistance genes from sexually incompatible Solanum species into cultivated potato. 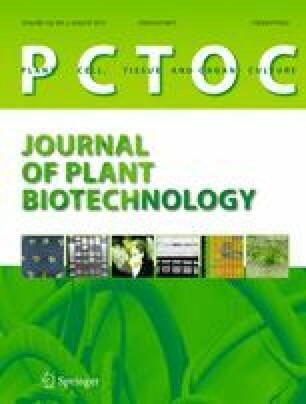 Here we report the effect of the recipient commercial tetraploid potato cultivar on the genetic make-up of the somatic hybrids (SHs) with an accession of the incongruent diploid species Solanum bulbocastanum Dun. The SHs were produced by mesophyll protoplast electrofusion. The analysis of ploidy by flow cytometry was first used to select hexaploid putative SH shoots but SSR and AFLP markers, DAPI staining and later flow cytometry evaluation of ploidy reveals symmetric and asymmetric SH plants regeneration in proportions that depend on the potato cultivar. The growth and fertility of the SHs support the effect of recipient cultivar. Out of five different fusion combinations, the highest number of SHs and tuberosum morphology was recorded for the combinations: blb41 (+) ‘Delikat’ 235 SHs (104 symmetric and 131 asymmetric) and blb41 (+) ‘Rasant’ 33 SH plants (22 symmetric, 11 asymmetric). There were fertile SHs of these combinations and BC1 and BC2 progenies were obtained. Less successful were the combinations: blb41 (+) ‘Quarta’ 64 SHs (57 symmetric and 7 asymmetric), blb41 (+) ‘Baltica’ 25 SHs (16 symmetric and 9 asymmetric), which were infertile and blb41 (+) ‘Agave’ with only one highly asymmetric non-viable SH plant. The production of a large number of SHs with diverse commercial cultivars is a prerequisite for further selection of useful pre-breeding material. The causes of nuclear constitution asymmetry and somatic incompatibility of the two species are also discussed. The online version of this article (doi: 10.1007/s11240-015-0777-4) contains supplementary material, which is available to authorized users. E R-T acknowledges the financial support of a grant of the Romanian Authority for Scientific Research, CNCS-UEFISCDI project number PNII-ID-PCE-2011-3-0586. Márta Molnár-Láng and Éva Szakács are kindly acknowledged for their help with GISH and late flow cytometry analyses. The authors wish to thank technical staff for excellent assistance. We gratefully thank T. Dixon for his helpful revision of the manuscript.